(Nanowerk News) The ability to ‘thread’ a molecular ligand through a metal–organic framework (MOF) to alter the pore size of the material — and yet allow the MOF to retain its crystallinity and principal structural features — has been demonstrated in a new study by A*STAR ("Stitching 2D Polymeric Layers into Flexible Interpenetrated Metal–Organic Frameworks within Single Crystals"). MOFs are three-dimensional, coordination networks comprising metal ions and organic molecules and usually are crystalline, porous materials with many applications including storage of gases such as hydrogen and carbon dioxide. While ‘threaded’ MOFs have been synthesized in the past, they remain challenging to easily and reliably produce. Inclusion of molecular ligands creates a flexible, interpenetrated MOF — similar to stitching a thread through fabric to make a new pattern. Use of bridging ligands of varying lengths potentially could lead to materials with many different properties in terms of gas adsorption, gas separation and catalysis. Now, Andy Hor and colleagues at the A*STAR Institute of Materials Research and Engineering and the National University of Singapore show how solvate molecules adhering to the surface of the channels on a cadmium-based coordination polymer can be replaced with nitrogen-containing ligands that form a bridge between two metal ions of the MOF. 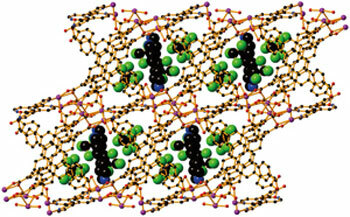 These dipyridyl ligands of lengths varying from 0.28 to 1.10 nanometers are then threaded through the pores of the framework to form flexible MOF structures with different porosities (see image). A surprise for the researchers came when long dipyridyl ligands that were expected to cause structural collapse of the framework were accommodated by slippage of two-dimensional layers within the structure. “Our observation that within these crystals, two side-by-side layers can slip or slide across to create space for guests suggests that these MOFs are actually smarter than we thought because they can respond to external stimuli without losing their crystallinity,” says Hor. The researchers used the solvent diethylformamide (DEF), rather than the less bulky dimethylformamide solvate, to create cadmium-based double layers with large enough channels to permit the dipyridyl ligands to thread through. They also replaced other DEF solvates within the structure with water to minimize congestion. “We hope to apply a similar approach to other MOFs — using a range of metals and organic molecules — and to test the boundaries for creating adaptable three-dimensional materials,” says Hor. “We could introduce different functional organic moieties to the present MOF and create materials with magnetic, electronic and photonic functionalities.” Also, the dynamic nature of these MOFs makes them attractive candidates for selective gas adsorption materials.